A great variety of people use the BioField Reader imaging system. Many are Complementary Therapists who use biofield imaging in their clinics; others want to pursue their own areas of research such as the paranormal, Earth energy, crystal energy or feng shui and so on. We realise that not everyone wants to travel to attend a course - which can be very expensive and time consuming, with travel and accommodation costs - but prefer to study at home with guidance from us, the Resolutions Team. Some handy tips on using your camera. You can use, video, webcam, still digital or mobile phone. Includes which are best settings to use on your camera. Jane has many years experience in Biofield Imaging. She worked with Harry Oldfield in the 1990s and was a trainer for the PIP Biofield Imaging system. Jane has experience of teaching Biofield Imaging both to groups and to individuals. She acted as an on-site Consultant to set-up the Centre of Biofield Sciences. "Our training shows you how to use your BioField Reader. Our aim is to help you get the most out of your system and feel confident about your results." We supply a comprehensive tutorial with every BioField Reader system. This is an A-Z guide which clearly outlines everything from installing the program to how to use the functions. The User Manual is free to download. 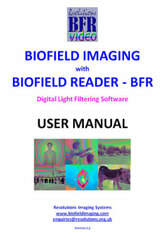 The Manual has information on how to set-up the scanning room, lighting and camera set-up and how to analyse biofield scans with regard to colours and patterns. All BioField Reader users get support from the Resolutions Team via email. We encourage you to send in your scans which we help you to analyse. Jane Solomon (Resolutions' Trainer) has many years experience of biofield imaging, is always on hand to answer questions.and help. There is no charge for this option. This is the same as OPTION 1 with the addition of spending time with Trainer Jane Solomon at the clinic where she practises in Epping, Essex, UK. You will have one-to-one time with Jane. She will show you lighting set-up, scanning conditions and analysis of scans. This session will also include looking at previous research with biofield imaging. If you would like this session to concentrate on a particular aspect of imaging which you are interested in, please let us know and we will try to accommodate your wishes. The one-to one session lasts 4 hours and costs £205(GBP). Discount per person is given for 2 or 3 people wishing to attend at the same time. Certificates of Attendance available for this option. Skype sessions are available on request for a fee of £40 per hour. These Skype sessions can include Option 2 content or, can be about whatever you would like to discuss e.g. paranormal research, crystals, energy connections between people etc. Please email us to arrange. *Training Courses available on request for organisations and groups. This can include topics below, but we can also tailor a course to your areas of interest/research. With the help of modern technology we are able to process photos and moving video footage using digital light filters to reveal the Human Energy Field/Biofield in colour as it moves around the body. This is done by filtering gradations and patterns of light not normally visible to the human eye. Each individual’s unique colours and patterns are displayed in vibrant colour on the computer screen. Therapists say the scans show useful information. Interestingly, ‘sensitives’ say that the light patterns shown by BFR are similar to those they see with their eyes.